The Trumpet Creeper is a deciduous, clinging vine with dark green, 6"-12"
compound leaves consisting of many smaller leaflets. They are capable of quickly climbing to heights of 30 feet or more if conditions are favorable. bright scarlet orange, 3" trumpet shaped flowers. Trumpet Creepers are hardy in USDA zones 4-10. They will require a support structure to grow on, and it is a good idea to have this in place before planting. 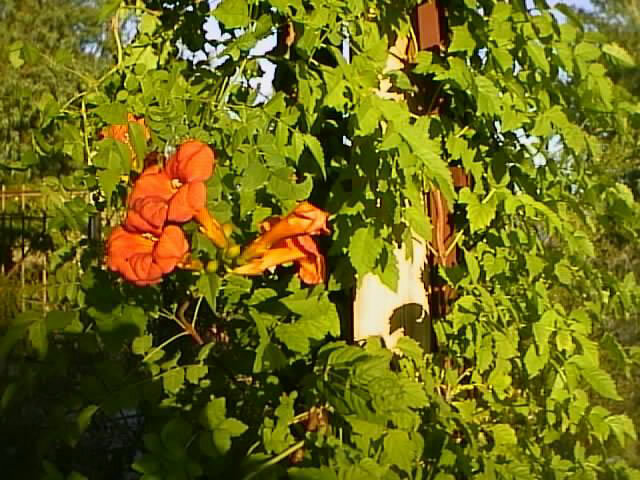 Trumpet Creeper vines are happy to climb over arbors, trellises, fences, walls and even high up into a tree. They will attach themselves to the support with aerial roots along the stem, but you should add supplemental ties until the roots get a good grip, especially in wind prone areas . 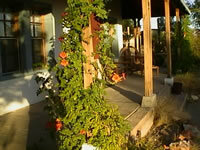 Plant your Trumpet Creeper where it will receive full sun to light shade for most of the day. They should be grown in reasonably rich, moist,well-drained soil. Water regularly and thoroughly during the summer months. Feed monthly during the growing season, with a good, all purpose fertilizer. Pinch back the tips of new growth frequently to induce bushiness. to a few buds each in late winter or before new growth starts early in the spring. Remove seed pods as they form to extend the blooming season. Trumpet Creepers bloom on new wood from the current year. Trumpet Creeper vines can be propagated by tip cuttings taken in early to mid-summer. Sucker growths that appear near the base of the plant can be dug up and transplanted. Tip layering is also an easy way to propagate new Trumpet Vines. Place the seeds in moistened growing medium and keep in the refrigerator for two months. Seeds can bee sown into the garden in early spring or they can be started indoors. Indoors, maintain a temperature of 70° within the growing medium until germination, which takes 15-20 days. Do not move young plants outdoors until the soil is well warmed in the spring.